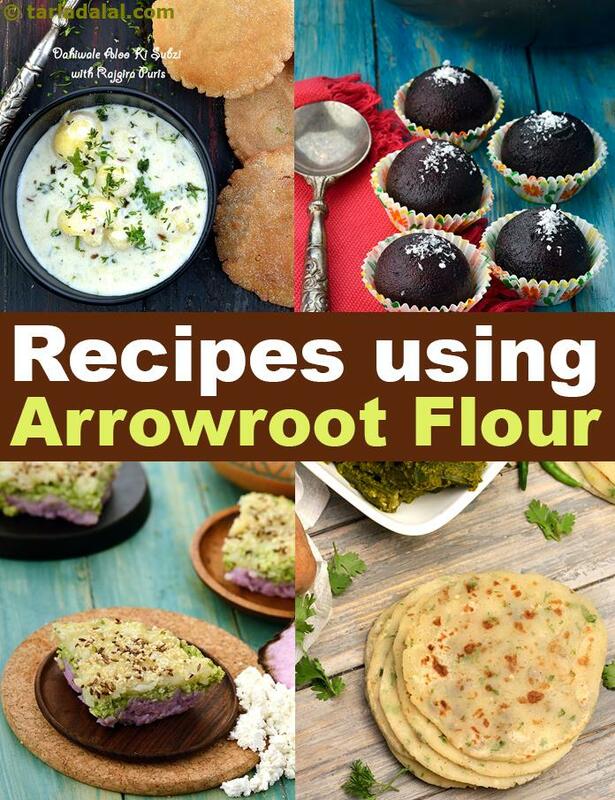 arrowroot flour recipes collection. Arrowroot flour, also known as kooya or aralot, is a fine white colored powder that is used to thicken sauces and soups and also for binding purposes. It is made from the starch of the arrowroot plant and looks very similar to cornstarch, also has similar properties. Not only is it used for savory items, it can also be used to set jellies and ice cream. Sweets like Gulab Jamun and Ghevar require proper binding so that they don’t break down when cooked. For this purpose we add a little arrowroot powder to ensure adequate binding. Here, even a small amount is enough as it is string and has double the binding powder of wheat flour. As a binding agent it is also used in various tikkis and pakodas. This way it works very well and is a perfect substitute to cornstarch in case if anyone doesn’t want to use it. Recipes that use this flour for this purpose are Kand aloo Pakoda or any other pakoda for that matter. One big advantage of arrowroot flour is that it can be eaten during the fasting days. During those days, people eat food known as faraal in which cornstarch is a food item that has to be avoided. In such situations, arrowroot is the perfect substitute for! Whether it is in Faraali Pattice or something more innovative like Layered Handvo made with kand, potatoes and paneer, it is fit for the occasion. This flour can even be added to soups, curries and subzis to make them thick and give them a proper, less watery consistency which is smooth like in Dahiwale Aloo ki Subzi. For this purpose it is important to first make a slurry out of room temperature water and flour, mix it till there are no lumps and then add it to the gravy. If you add the flour directly to a hot liquid, it will immediately start forming lumps and will not give a smooth gravy. Arrowroot is also a gluten free flour which makes it fit for those with a gluten allergy. Due to this property, you can use it for baking gluten free breads like Buckwheat and Quinoa Bread or to even make Indian food like Faraali Khandvi. Hope you enjoyed this collection of Arrowroot flour recipes, scroll down for more. Masala aloo roti, the unique flavour of this roti is crafted by the jeera, green chillies and pepper along with the potatoes, which also adds softness to the roti. The potatoes and maida also aid in binding. Relish this delight with a vegetable of your choice. Recipe Palak koftas or spinach dumplings are cooked in a spicy thick onion-tomato based gravy. The gram flour or besan blended palak koftas are fried and simmered in the curry for this delicious recipe. This is a wonderful recipe for cooling the body. arrowroot powder is an excellent ingredient for bringing down body heat.